Beginning February 12 and running through March 11 during National Catholic Sisters week, six billboards will feature Sisters that invite us all to “Pray. Act. Be the Change.” Locations of these billboards are in the North Hills, Oakland, South Hills, East Pittsburgh, West Hills, and Beaver County, areas where Catholic Sisters have been present for over a century. Stories behind the displayed images can be found at sistersofwpa.org. Additional photos and stories of Catholic Sisters can also be found at that site where resources are available for persons inspired to action through prayer, service and support of efforts that align with the hope they hope to see in the world. The Sisters will also engage in a collaborative social media campaign using the hashtags #PrayActChange and #NCSW. “Pray. Act. 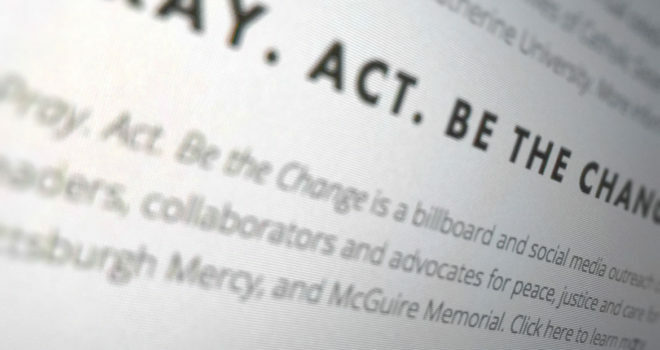 Be the Change” is a collaborative project of the Catholic Sisters Leadership Council (CSLC), and made possible through funding from a $1,000 National Catholic Sisters Week mini-grant and donated space from Lamar Advertising. The project’s intent is to inspire others through increasing the visibility of Catholic Sisters as they continue to serve as leaders, collaborators and advocates for peace, justice, and care for creation. CSLC represents more than 17 congregations of Catholic Sisters serving western Pennsylvania in various roles supporting children, families, the poor, elderly, the sick, displaced persons and others in need. The CSLS’s purpose is to advance the missions of religious communities and promote understanding of women religious, both within their individual congregations and throughout the broader community. Collaborative efforts include the establishment of Sisters Place, a supportive housing ministry for single parent families, as well as the documentary We Are All Immigrants which addresses comprehensive immigration reform. The collaborative group has also taken public stances on peace and justice issues.